Karen's job is to fix people - she's a psychiatrist. She's supposed to know what makes people tick. She's supposed to be able to find out people’s deepest fears. She's supposed to be able to help people. It's also been her role as a friend - to help and fix Eleanor, a tired mother of two children, and Bea, a party girl with a lonely heart. But then Jessica steps into Karen's office. Jessica is different. She should be the patient, the one Karen helps. But she knows things about Karen and her friends and her personal life – things no patient should know. And as her life begins to unravel, Karen begins to wonder if she should have let Jessica in. The three women at the heart of this story have been friends since school and think they know each other inside out. But, as with every good psychological thriller, Karen, Eleanor and Bea all have secrets that are buried deep and that, with the arrival of Jessica, begin to worm their way to the surface threatening everything they hold dear. 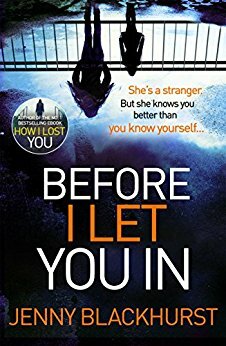 Before I Let You In is told from the points of view of Karen, Eleanor and Bea, and as readers we don't know who to trust or what we can trust to be true. The book starts slowly but always with a sense of foreboding, and as the story unfurls, reaching into dark corners, it becomes a book that is practically unputdownable. With twists, turns and plenty of red herrings, great characterisation, brilliant pacing and a clever plot, I certainly couldn't put it down. It is the second of Jenny Blackhurst's books I have read, and I'm already looking forward to her next. Jenny Blackhurst grew up in Shropshire where she still lives with her husband and children. Growing up she spent hours reading and talking about crime novels – writing her own seemed like natural progression. Inspired by the emotions she felt around her own son’s birth, How I Lost You is Jenny’s thrilling debut crime novel. Mary-Jane Riley wrote her first story on her newly acquired blue Petite typewriter. She was eight. It was about a gang of children who had adventures on mysterious islands, but she soon realised Enid Blyton had cornered that particular market. So she wrote about the Wild West instead. When she grew up she had to earn a living, and became a BBC radio talk show presenter and journalist. She has covered many life-affirming stories, but also some of the darkest events of the past two decades. Then, in true journalistic style, she decided not to let the facts get in the way of a good story and got creative. She wrote for women's magazines and small presses. 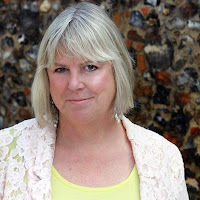 She formed WriteOutLoud with two writer friends to help charities get their message across using their life stories. Now she is writing psychological suspense, drawing on her experiences in journalism. The Bad Things by Mary-Jane Riley was published by Harper Collins/Killer Reads. Her second book, After She Fell, also published by Killer Reads, is out on April 28th. In her spare time Mary-Jane likes to walk the dog and eat a lot.